If you know the proper care and feeding of pet rabbits, you can expect your pet to live a long and happy life. Rabbits can be wonderful companions if you are prepared to give them the attention needed. Learn more about their needs. 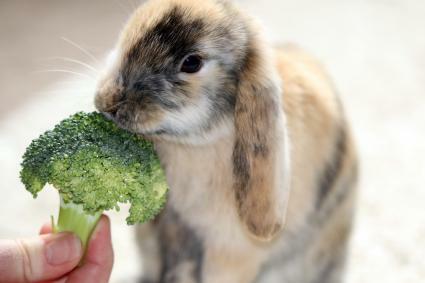 Rabbits are herbivores, which means they eat plant-based foods. A good rabbit diet includes water, hay, fresh vegetables and fruit, and specially made rabbit food pellets. Feed your young rabbits pellets, and then gradually increase the amount of fresh vegetables and hay you give them. The pellets are vitamin rich and high in fiber. Water should be available at all times. Make sure the vegetables, fruit, hay, and any outdoor plants your pet may graze on are pesticide free. Feed fruit once or twice a week based on a ratio of one to two tablespoons per five pounds of rabbit body weight. Rabbits weaned from their moms at the age of eight weeks should be freed fed rabbit pellets and alfalfa hay until they are three months old. At this point, you can begin slowly adding vegetables in. Only add one type of vegetable in and monitor the bunnies for any signs of diarrhea. Once your rabbit is seven months old, he can start to have unlimited access to timothy hay and you can wean them off the alfalfa and reduce their pellets to a 1/2 cup per day for every six pounds of their weight. You can also start introducing them to fruit at a rate of one or two ounces a day, and as with vegetables, start with one type of fruit at a time. Once they hit one year of age, you can move them to their regular adult diet. If your rabbit will be an outdoor pet, purchase or make a rabbit hutch. 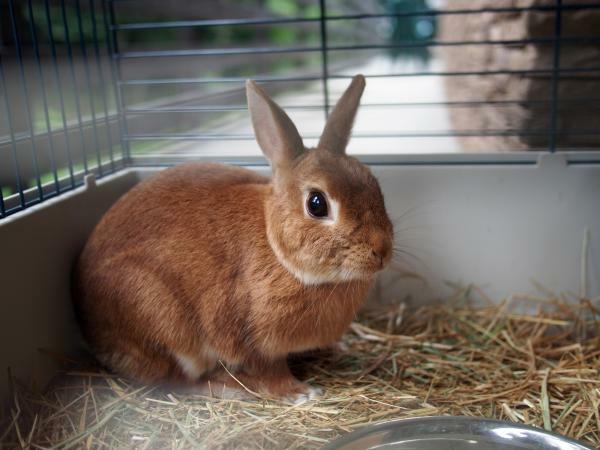 If you choose to house train your rabbit, buy a small floor cage that is made for indoor purposes. This type of cage also acts as a litter box for the rabbit. The cage is over the litter box for easy cleaning. Once the rabbit becomes used to her cage, you can leave the door open and she will leave the cage and come back to eat, sleep and defecate once she is house trained. Rabbit teeth continue to grow all through their lives, so they need to chew to keep their teeth healthy and at the proper length. Provide your pet with chewing blocks purchased at your local pet supply so you can be sure the wood is free from any chemical treatments. You'll also want to look at your pet's teeth periodically to check for malocclusions. A malocclusion occurs when teeth overgrow and no longer fit together as they should. This condition can ultimately result in a rabbit being unable to eat, so it's best to check periodically and consult your vet if something doesn't look right. Pet rabbits can live up to 15 years with the proper care, but the average lifetime is six to eight years. The female is called a doe, and the male is called a buck. The female reaches sexual maturity and can have a litter as early as four months old while the male reaches sexual maturity at around five months old. Baby rabbits are called kits. You can have your rabbit spayed or neutered. Spayed and neutered rabbits make better pets because they are less aggressive, become more docile, and are less territorial. Rabbits can make noises such as a growl or a squeal. The next Chinese Zodiac Year of the Rabbit is 2023, followed by 2035. Rabbits require your time and attention or they will become wild. Children should be supervised around a pet rabbit. Rabbits can have a heart attack if they become extremely frightened. Serious pet rabbit owners should check into joining an organization such as the House Rabbit Society to get support and knowledge from other pet rabbit owners. These types of societies help rescue domesticated rabbits from homes and shelters when people do not want them anymore. These groups also help educate future pet owners on the proper care and feeding of pet rabbits. The care and feeding of pet rabbits is a fairly simple yet rewarding job. However, it does take dedication to keep up with that care week after week and, ultimately, year after year. With the proper care and feeding of pet rabbits, you can expect your rabbit to become sociable, docile and even huggable. He may even sit on your lap just like a lap dog. Just be sure you can make the commitment to provide him with everything he needs, and he'll reward you with warm and fuzzy companionship.